There are a number of people out there willing to work on your air conditioner, or heating system. Many of them, however, have limited experience in the industry and may still have a thing or two to learn about before working on your system. Therefore, we don’t advise you put the well-being of your HVAC systems at risk by hiring anyone less than a pro. Fortunately, there are plenty of qualified HVAC contractors out there. But only some of these are great technicians with the training and skills that go above and beyond. So, when searching for such a company, what qualities should you look for? 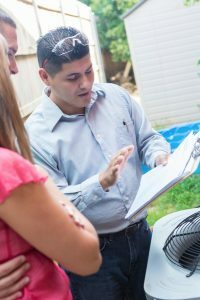 It’s imperative you work with a contractor who offers every service you may need over the years, in regards to your HVAC systems. For instance, you may only be looking for an installer at the moment, but perhaps in the near future you’ll need a repair, and you’ll certainly need routine maintenance, starting a year out from your installation. Choose a company that offers only installation and then you’re back at square one when you need other services. When you find a technician who can accurately install your HVAC equipment, you’ll want them to be able to reliably service it as well. Choose a Chicago HVAC company you find yourself wanting to work with time and time again for all your HVAC needs, including indoor air quality products and services. NATE certification (North American Technician Excellence) is the most widely-recognized certification there is in the HVAC industry. Not every company hires NATE-certified technicians. It’s not required to work in the field, however it does indicate that their technicians have studied dutifully and gained enough experience to pass rigorous tests in order to prove their HVAC qualifications. Living in the Chicago area, you know how unpredictable our weather can be. Well, your HVAC system can sometimes be just as unpredictable. Although maintenance reduces the risk of this occurring, you could find yourself with a malfunctioning heater in the dead of winter or a troublesome AC on the hottest of summer days. But what if this occurs after normal business hours? Well then you better hope that the HVAC company you’ve chosen has emergency services. Offering 24/7 services for customers proves that the contractor cares about the people who live and work in their service areas. You’ll be thankful when and if you have an HVAC system breakdown that you have the name of a trusted company you can call literally any time. Just by the virtue of providing maintenance you will find yourself paying less each year for AC services. But in addition, you may receive priority service as well as discounts for being a part of a professional maintenance program. Contact Shavitz Heating and Air Conditioning today for trustworthy HVAC pros.